Well look no further than Carbonless on Demand. We have been providing custom carbonless printing services for over 27 years! We offer a large selection of services, which are designed to met the requirements for most businesses. You will find sequential numbering, wrap around cover, non-standard paper sequences, and many more printing options and services. What are the advantages of No Carbon Required Carbonless Form Paper? Carbonless form paper is ideal for maintaining a carbon copy of a form, commonly associated with a business transaction. This copy can be provided as a receipt to a customer, for record keeping purposes or other. 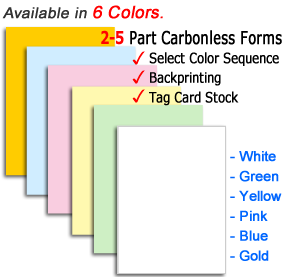 Carbonless forms are often referred to as No Carbon Required paper and are available in 2-part forms, 3-part forms, 4-part forms or 5-part carbonless paper. Many businesses often use these forms for creating a carbon copy of an invoice, invoice books, receipt book or other business forms. This type of form paper is coated to allow for the transfer of written or typed data to additional pages (such as in a 2 part carbonless form). What is No Carbon Required Paper? No Carbon Required Paper is another name for carbonless paper. This term is commonly used in the printing industry when referring to carbonless form printing, such as for business forms and carbonless invoice printing. What is the Standard Color Sequence? Carbonless paper (carbonless carbon paper) often referred to as No Carbon Required Forms, is used for creating a carbon copy (duplicate forms) of invoices, invoice books, receipt books or other carbonless business forms. Create your own custom carbonless forms, complete with your logo or other artwork. Buying your carbonless forms from retail stores and chain stores can give your company an “generic” look, which is to be avoided in today’s uncertain market. Order your carbonless forms from us now and join the ranks of those who have discovered the power of first impressions and operating a business on a more professional level.